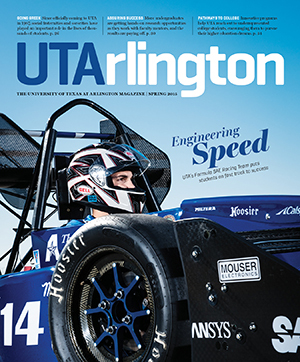 Take an in-depth look at UT Arlington’s internationally acclaimed Formula SAE Racing Team in the spring issue of UTArlington Magazine. You’ll also find stories about the University’s Greek community, programs to help high school students navigate the road to higher education, and expanded opportunities for undergraduates to participate in research. Theoretical physicist Michio Kaku presents his thoughts on "Physics of the Future" for the Maverick Speakers Series event at 7:30 p.m. Thursday, Feb. 19, in Texas Hall. An autograph signing will follow the lecture. Additional standby tickets will be available at the box office beginning at 6:30 p.m. Thursday. Standby ticket holders will be seated, space permitting, 10 minutes before the show starts. Accommodation is anticipated but not guaranteed. Dr. Kaku is one of the most widely renowned contemporary figures in science. His particular area of specialty is Einstein’s unified field theory, which Kaku is attempting to complete. He is also known for his work in predicting trends that affect business, commerce, and finance. Be ready for your future when you attend next week's Spring Job Fair for UT Arlington students and graduates only. The fair is 10 a.m.-3 p.m. Tuesday, Feb. 24, at the Maverick Activities Center. No registration is required for the free fair. Bring a student ID and plenty of résumés. Employers will be on hand to talk with students, take résumés, and discuss job possibilities. See a list of companies attending the Job Fair. See the workshops schedule, which also includes programs after the fair and during the semester. The Career Development Center also sponsors interview sessions with companies. For more information on the Job Fair and job hunting, contact the Career Development Center online or at 817-272-2932. From the 1895 start of Arlington College and through eight names, UT Arlington has seen plenty of changes, students, leaders, and historic events. 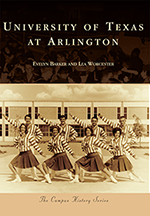 Those are the basis for University of Texas at Arlington, a new book of historic photos compiled by UT Arlington librarians Evelyn Barker and Lea Worcester. Images used in the book are from Special Collections, various campus departments, University Communications, and Tarleton State University, with whom UT Arlington shared a spirited sports rivalry in the 1930s. University of Texas at Arlington will be available Monday, Feb. 23, at local booksellers and through Arcadia Publishing. Read more about the book on UTA's history. 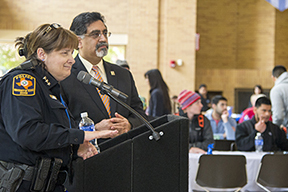 UTA Police Chief Kim Lemaux answered questions about security with President Vistasp Karbhari during Pizza with the President. The lunchtime info session for students was, appropriately, on Monday, Presidents Day. Progressive solutions to social problems and strategies that will drive social change are the focus of the Center for African American Studies' third annual conference Friday-Saturday, Feb. 20-21, at the E.H. Hereford University Center. "Critical Issues in the Black Community: Race and Social Justice" will feature actor and activist David Banner, who hosts an open mic night on Friday. Saturday includes a community research panel discussion and filmmaker Darius Clark Monroe screening his documentary Evolution of a Criminal, which explores how he became a teenage bank robber. The Rev. Bernice King, minister, attorney, and daughter of the Rev. Martin Luther King Jr., will give the closing keynote speech Saturday. Are you attending a conference this spring and want to learn the best ways to communicate your research to the public? Or are you presenting at the ACES symposium and want to learn how to format your oral or poster presentation? Attend a workshop designed to introduce you to the best practices for poster and oral presentations. The program is 2-4 p.m. Tuesday, Feb. 24, in Room 105 of Nedderman Hall. Visit the Office of Graduate Studies website for more information and register online. Various lanes on Cooper Street between Mitchell Street and Interstate 20 will be closed for the repair of the existing surface, a new asphalt overlay, sidewalks, driveway reconstruction, and new traffic signals. Installation of curbed medians will start at Mitchell Street and move south to Arkansas Lane. Sidewalk, ramp, and driveway improvements will start at Arkansas and move south. Construction is scheduled to be finished in summer 2016. 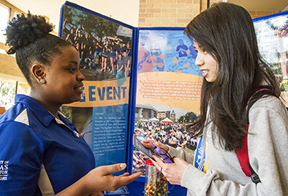 Kiriakis Newman, left, business senior, tells Phuong Anh, electrical engineering sophomore, about The Big Event community service day at last Wednesday's Volunteer Fair. UTA Volunteers hosted the event to share volunteer opportunities with the campus community. The 2014-15 Outstanding Student Leader nominations are due today, Tuesday, Feb. 17. The nomination form is available online. Read about the awards criteria. Awards are for overall leadership, freshman and sophomore leaders, and the Wayne Duke Outstanding Student Leader Recipient for overall leadership from freshman to senior year. For questions, email Kerri Ressl at kerri@uta.edu. Facilities Management will test the emergency electrical generators 1-2:30 p.m. Friday, Feb. 20. Buildings involved are Carlisle Hall, Engineering Lab Building, Engineering Research Building, Hammond Hall, Central Library, Life Science Building, Nedderman Hall, Trimble Hall, and Woolf Hall. 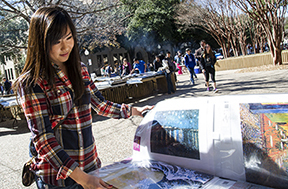 Esther Zhi, education junior, flips through posters at the Beyond the Wall art sale last week. The event offered decor options for residence halls or other homes. Print 3-D objects, discover how to add sensors to projects, and create a virtual reality with workshops at the UTA FabLab. The workshops are 3-D Printer, Tuesday, Feb. 24; Arduino, Saturday, Feb. 28; and Oculus Rift, Monday, March 2. All are 5-7 p.m. in the FabLab on the first floor of the Central Library. Read more about the FabLab workshops. The UTA Bookstore offers 25 percent discounts on in-store items during its sale Wednesday-Thursday, Feb. 18-19. Items on sale include all Champion and Jansport apparel, backpacks, bags, headphones, earbuds, auto accessories, socks, reference and bargain books, writing instruments, and tech accessories. Freshman progress reports are being posted through Sunday, Feb. 22. The faculty deadline is Feb. 20, but instructors can report progress report grades at any time before then, and you can view your progress reports as soon as the grades are entered. Midterm progress reports will be posted Monday, Feb. 23-Thursday, March 5. The faculty deadline is March 5. Video and board games are sure to cure your boredom this week. 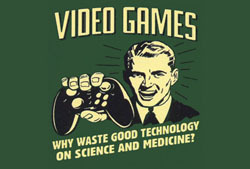 UTA Libraries hosts Game Night on the third Thursday of February, March, and April. The fun is 6-9 p.m. Thursday, Feb. 19, in the basement of the Central Library. Video and board games are available, but you can bring your own to share. Test your strategy at the UTA Chess Tournament starting at 4:30 p.m. Friday, Feb. 20, in the Nedderman Hall atrium. A $3 entry fee puts you in the competition for cash prizes and the champion award. To register or join the Maverick Chess Club, email cbklauss6@gmail.com or shivamurthi.kj@gmail.com. Art as a Weapon for Social Change Award-winning filmmaker Ya’Ke Smith, assistant professor of film and video, utilizes clips from his nationally acclaimed films to lead a discussion on bringing social justice issues to light and actively processing the emotions that come with them. Free. 7 p.m. Lone Star Auditorium, Maverick Activities Center. Multicultural Affairs, Black History Month. Clavier Piano Recital Piano students perform. 7:30 p.m., Irons Recital Hall, Fine Arts Building. Music. Women's Basketball Mavericks vs. Appalachian State. Tickets $7-$50; $3 students. 5 p.m., College Park Center. Also vs. Louisiana-Lafayette, 5 p.m. Saturday, Feb. 21. Athletics. One Mic Stand Comedy Series Adam Mamawala performs. Free. 7:30 p.m., Bluebonnet Ballroom, E.H. Hereford University Center. EXCEL Campus Activities. Men's Basketball Mavericks vs. Appalachian State. Tickets $7-$50; $3 students. 7:15 p.m., College Park Center. Also vs. Louisiana-Lafayette, 7:15 p.m. Saturday, Feb. 21. Athletics. Softball UT Arlington Invitational. Tickets $5-7; $3 students. Mavericks vs. Prairie View A&M, 11:30 a.m. and vs. Texas Tech, 7 p.m., Allan Saxe Field. Also, vs. Missouri-KC, 10 a.m. and vs. DePaul, 2 p.m. Saturday, Feb. 21; vs. Missouri-KC, 10 a.m. and vs. Prairie View A&M, noon Sunday, Feb. 22. Athletics. Baseball UTA Hilton Invitational. Tickets $5-7; $3 students. Mavericks vs. Southeastern Louisiana, 3 p.m., Clay Gould Ballpark. Also, vs. Michigan State, 3 p.m. Saturday, Feb. 21; vs. Houston Baptist, 3 p.m. Sunday, Feb. 22. Athletics. 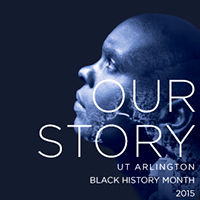 'Our Story' Exhibit See the achievements of African Americans through history. Free. 8 a.m.-8 p.m., University Center Gallery, E.H. Hereford University Center. Through Friday, Feb. 27. Multicultural Affairs, Black History Month. Mavs Got Talent Auditions Talent show auditions. Free. 11 a.m. Wednesday, Feb. 25, Palo Duro Lounge, E.H. Hereford University Center. Excel Campus Activities. Friday Night Film: 'Interstellar' Rated PG-13. Free, fresh-popped popcorn while supplies last; other concessions for sale. Tickets $1, $1.50 with credit card. 7 p.m. Friday, Feb. 27, Rosebud Theatre, E.H. Hereford University Center. EXCEL Campus Activities. Jazz Night Jai Malano, jazz vocalist and UTA alumna, performs. Enjoy live music, mocktails, a photo booth, poker, blackjack tables. Free. 7-9 p.m. Friday, Feb. 27, Carlisle Suite, E.H. Hereford University. Multicultural Affairs, Black History Month. Writing Workshop: Abstracts Graduate students learn how to distill a large work into a concise abstract. 6:30 p.m., Room 411, Central Library. Also, Personal Statement, for graduate students, 6:30 p.m. Tuesday, Feb. 24. Writing Center. Advising: Test/Class Prep Need some help prepping for an exam or overall class preparation? This quick presentation will help you learn how to organize your notes. Free. 11:30 a.m. and 1:30 p.m., first floor lobby, Ransom Hall. Also, 10:15 a.m. Friday, Feb. 20. University Advising Center. CMAS Speaker Series Arturo Arias, the Tomas Rivera Regents Professor in Latin American Literature at UT Austin, presents "Central American-Americans in the Second Decade of the 21st Century." Free. 5:30 p.m., location TBA. Center for Mexican American Studies. Writing Workshop: Subject-Verb Agreement Free. 6 p.m., Room 411, Central Library. Also, Fragments and Run-on Sentences, 6 p.m. Monday, Feb. 23; Finding and Evaluating Sources, noon, Wednesday, Feb. 25. Writing Center. Advising: Academic Standing Seminar Learn the levels of academic standing, the Table of Standards, and plans to move forward for academic success. 10 a.m. Thursday, Feb. 26, Room 104, Preston Hall. University Advising Center. Advising: Major Exploration Seminar Discuss resources for choosing a major with an adviser. 10:15 a.m. Friday, Feb. 27, Room 104, Preston Hall. University Advising Center. Air play: Senior guard Lonnie McClanahan led in scoring in two games last week. The Mavericks are at College Park Center for games against Appalachian State on Thursday, Feb. 19, and Louisiana-Lafayette on Saturday, Feb. 21, which is the College of Engineering Night. The men’s basketball team defeated Texas State 70-61 on Thursday in San Marcos but dropped a 97-91 decision Saturday to South Alabama in Mobile. 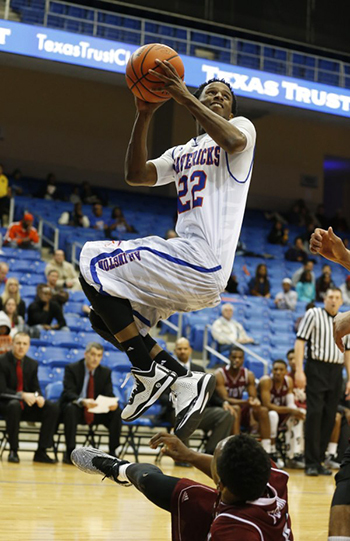 Senior guard Lonnie McClanahan was UTA’s leading scorer in both games, with 18 points against Texas State and 20 against South Alabama. The Mavericks are 14-10 overall and 8-6 in the Sun Belt Conference. The team returns to College Park Center this week for games against Appalachian State on Thursday, Feb. 19, and Louisiana-Lafayette on Saturday, Feb. 21. A dominating effort at both ends of the court lifted UTA to a 63-46 victory Saturday afternoon over South Alabama in Mobile. Freshman guard Cierra Johnson led the Mavericks with 12 points, eight rebounds, and three steals. The win, which followed a 65-58 overtime loss Thursday at Texas State, improved the team’s record to 13-10 overall and 7-7 in Sun Belt Conference play. Next up are home games against Appalachian State on Thursday, Feb. 19, and Louisiana-Lafayette on Saturday, Feb. 21. The men’s and women’s indoor track and field teams each placed second Saturday at Wichita State’s Herm Wilson Invitational in Wichita, Kan.
Senior Noemie Forget broke the UTA pole vault record, and sophomore Ambria Tisdell broke her own school record in the weight throw. Competing individually Saturday at the Iowa State Classic, senior Emil Blomberg broke a 29-year-old school record in the indoor mile. The Mavericks compete in the Sun Belt Conference Championships Monday-Tuesday, Feb. 23-24, in Birmingham, Ala.
• The softball team improved to 8-2 after winning four of five games over the weekend in the Maverick Invitational at Allan Saxe Field. • The baseball team bounced back from two losses to defeat Stephen F. Austin 18-9 on Sunday at the Stephen F. Austin Tournament in Nacogdoches. • The women’s tennis team downed Texas-Pan American 7-0 on Sunday at the UTA Tennis Center. • The men’s tennis team defeated UT San Antonio 4-3 on Friday and Southern Miss 4-3 on Saturday at the UTA Tennis Center. Upcoming entry deadlines for intramural sports include wheelchair football, today, Tuesday, Feb. 17; outdoor soccer and foosball, Wednesday, Feb. 18; tennis, Friday, Feb. 20; and 4-on-4 flag football, Wednesday, Feb. 25.